How did you fight through the beginning of your practice? Did you feel odd walking into a space that is typically for smaller bodies? But I decided I was going to try, so with courage, I went and yup – I was the biggest person there! Only about 20 minutes into that class, I started to get light headed and ran outside into the cold winter air, breathing deeply, panting. I felt embarrassed. Out of place. Ashamed. Uncared for. Silly. Self-conscious. Physically exhausted. Emotionally small. I didn’t go back to another class for nearly a year because I was so scared of feeling like that again. Eventually, I found another studio that I felt comfortable at least showing up to. It is this feeling though, that drove me to open up More to Love. At the heart of More to Love Yoga is a deep understanding that you really care about how you’re going to feel in your body and I put that knowledge at the top of my list as your teacher. What has changed in your life since doing yoga? I’ve changed my way of thinking. I approach life with a new philosophy. We’ve all got different bodies, abilities, physical structures, and emotional connections, and I value making it possible for you to stay true to your own body’s needs. How do you work with others to help them find acceptance of their bodies and stop seeing themselves as problems to be solved, especially in a culture that constantly tells us to? 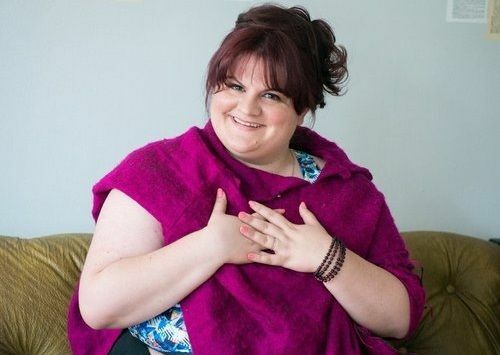 I created More to Love (MTL) in 2013 as an opportunity for students to learn and apply body acceptance to their own life, no matter your size. Health and wellness are a personal matter but living life fully, no matter your size, is the key to overall wellness and happiness. MTL focuses on overall wellness, inside and out. No diets, no insane workouts, no tricks, no shaming yourself into being “better.” Health and wellness are spectrums and the only body you’ve got to focus on is your own. What are the mental health effects of yoga combined with body acceptance? This question is at the core of why More to Love exists… I believe that feeling good in your body and mind (especially when you’re bigger) are deeply related. Wellness is not a one-size-fits-all, despite how it’s marketed to people. It’s a spectrum and the only one you’ve got to tend to is your own. Wellness in More to Love’s view is about being truthful with your body and mind, believing that sustainable actions stem first from love and kindness to the self. From this frame of mind, people can take wellbeing back into their hands and feel empowered based on what matters to them. 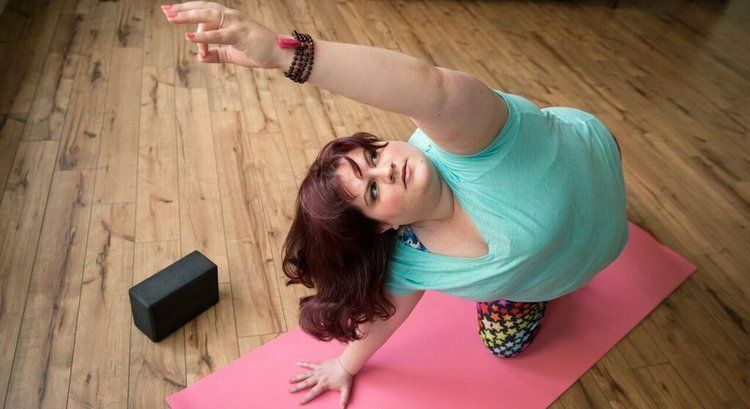 How do you practice body acceptance outside of yoga classes? How can our readers do the same? Personally, when I stopped trying to correct myself and fit into other people’s standards, I felt a greater sense of peace and kindness towards my body. Food wasn’t the enemy anymore, it became an ally to my overall well-being. Fitness wasn’t a way to torture my body, it turned into a fun way to move more in ways I actually liked. Shopping for clothing was no longer a dreaded and embarrassing chore, but a chance to express my own unique style and creativity. You can find more information about Rachel and her classes on her website. All photos are courtesy of Rachel Estapa and M. Davidson-Schapiro Photography.